The current configuration of the International Space Station as of Sept. 2009 at the end of NASA's STS-128 mission to deliver supplies and new gear. 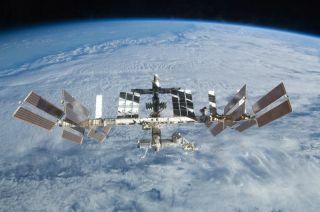 NASA?s spaceshuttle Atlantis is closing in on the International Space Station and on trackto link up with the orbiting laboratory later today. Atlantisand its crew of six astronauts are due to arrive at the space station at about11:53 a.m. EST (1653 GMT) to deliver tons of vital spare parts and other bulkygear that only NASA?s shuttles can haul. ?We?reready to get to station tomorrow,? shuttle commanderCharlie Hobaugh radioed Mission Control in Houston late Tuesday. ?See youthen.? But beforeAtlantis can dock, Hobaugh will fly the 100-ton spacecraft through an orbital backflip about 600 feet (182 meters) below the space station. The maneuver willallow astronauts aboard the station to snap high-resolution photos of thethousands of heat-resistant tiles on Atlantis belly as part of a standard heatshield check. An early lookat data from a Tuesday inspection of the heat shield panels lining Atlantis?nose cap and wing edges has found no immediate cause for concern. NASA expertswill continue to analyze that data, as well as the images from today?s photosession, to be sure. ?Preliminarily,we don?t have any significant issues,? said LeRoy Cain, head of Atlantis?mission management team. NASA has kept a close watch on the health of itsshuttles since the tragic loss of shuttle Columbia and its astronaut crew in2003 due to heat shield damage. Atlantis launchedMonday and is hauling more than 27,000 pounds (12,246 kg) of cargo tothe space station, including a pair of massive carrier platforms laden withlarge spare parts for the orbiting laboratory. The spares, which include hugegyroscopes, pumps and other gear, will be installed at the station during threespacewalks planned for the 11-day space mission. The shuttlewill also ferry NASA astronaut Nicole Stott back home from thespace station. Stott hasbeen living aboard the station since late August as part of the outpost?ssix-person crew. She will return home on Atlantis and is currently the last astronautplanned to be rotated on and off the station using a NASA shuttle before thefleet is retired in the next year or so. Stott andher crewmates have been tackling some glitches with the station?s systems. A 150-pound(68-kg) device used to distillastronaut urine into pure drinking water is broken and will have to bereturned to Earth on Atlantis. The stations? water processing assembly is alsoexperiencing problems. Neitherglitch is expected to pose any concern to Atlantis? week-long stay at the spacestation, Cain said. MissionControl roused the Atlantis astronauts at 4:28 a.m. EST (0928 GMT) with thesong ?Higher Ground? by Stevie Wonder, a tune specially selected for missionspecialist Bobby Satcher, who is making his first spaceflight. ?We?relooking forward to a good day,? Satcher said.